The Center for Food Safety (CFS) has formally filed a legal challenge demanding that the U.S. 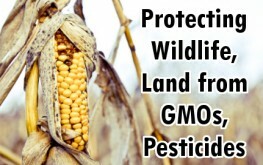 Fish and Wildlife Service (FWS) protect our wildlife and their habitat by banning the use of GMOs and neonicotinoid pesticides in National Wildlife Refuges, the sanctuary for countless trees, plants, flowers, and animals. The CFS is joined by Public Employees for Environmental Responsibility (PEER), the Center for Biological Diversity, and Beyond Pesticides. The legal action also calls on FWS to comply with the mandates of the Endangered Species Act (ESA) in order to ensure that America’s most jeopardized plants and wildlife are protected from Big Ag business as usual. The petition points out that our national refuges for wildlife are vital sanctuaries for current and future generations, and that allowing Dow, Monsanto, etc. to poison these lands for profit is beyond sane, but also against the FWS’s purpose – to protect these plants and animals. GE crops have continuously cross-pollinated organic crops and even wild plants. 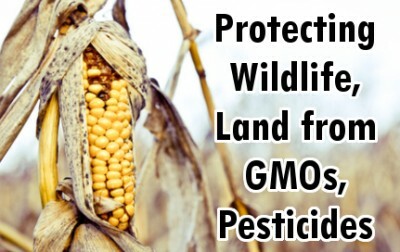 Half the US is already seeded with genetically modified seed, and this puts our wildlife lands in danger as well as lands normally considered as farmland. GMO crops are engineered to require more and more pesticides, and our ecosystem has proven it cannot withstand such huge toxic overload. The use of pesticides and herbicides has quadrupled over the past several years, and crop yields are not improving at all. Super-weeds are the norm now, and organic farmers are having more difficulty than ever growing without cross-contamination. Over 80% of flowering plants rely on pollination services from these critical species – and this includes plants in the wild, not just the flowers we plant in our gardens. These flowers are part of the intricate food chain, which also allows our food to be pollinated. Neonicotinoids have now been linked to the decline of pollinator species and the EU has banned them completely. CFS and its friends have repeatedly stopped FWS from permitting the growing of GE crops on numerous National Wildlife Refuges across the country (Northeast and Southeast). This is just their latest attempt to halt the growing beast that is biotech.